The Suite Hotel Atlantis Fuerteventura Resort will offer you a world of experiences with special attentions and personalised services for adults only (over 16 yrs): cuisine, relaxation, sports and hotel entertainment. The Suite Hotel Atlantis Fuerteventura Resort offers an “Adults Only Premium Club”, exclusive for adults over 16 yrs, featuring superb facilities and a first-class service so that you spent your holidays in maximum comfort and relaxation. Discover the Junior Suite Premium Club rooms. Spacious and comfortable, with views of the gardens or the swimming pool that offer guests privacy and a good night’s rest. The Junior Suite Premium rooms are equipped with everything you need for an unforgettable holiday. Light-filled rooms with one open-plan bedroom, dressing room, lounge with a sofa bed, fully equipped bathroom with shower and a balcony or terrace with views of the gardens or swimming pool. 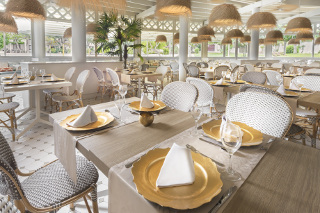 Enjoy a full and varied range of dining options throughout your holiday. Discover the “La Scala” restaurant, exclusively for “Adults Only Premium Club” guests. It combines the authenticity of traditional dishes with the exquisite flavours of “haute cuisine”. In addition, the “Adults Only Premium Club” guests can also enjoy access to all the other restaurants in the hotel. We want you to know how important it is for us, that you enjoy every minute of your stay with us. 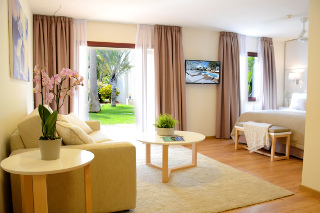 Enjoy unforgettable days in Fuerteventura in the “Adults Only Premium Club”. This resort provides magnificent, spacious grounds with facilities and a first-class service for adults seeking a peaceful and unique ambience in which to relax, as a couple or with friends.